The lapel is the folded over piece of cloth in front of a suit, jacket, or formal coat. To read more about the different styles of lapels please click the link. The notch label is most commonly found on classic 2-piece business suits. In most cases the width of collar and lapel are about the same. On the notch lapel a noticeable gap is cut between collar and the lapel. The peak lapel is typically the most formal type of lapel used and traditionally found on a tuxedo, formal dinner jackets, and double breasted suits and blazers. As the name suggest, the peak lapel is much more pointy. It usually points upwards and there is almost no gap between collar and the lapel. As the name suggest the shawl lapel looks like a scarf that is draped around the neck. 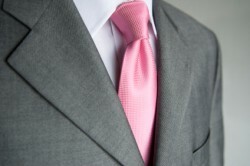 The collar and the lapel is not separated and usually form one continuous line. The shawl lapel is the least formal of all lapel styles and commonly found on informal dinner jackets and sports coats. Lapels usually have a button hole on the left side that is intended to hold a decorative flower. The width of the lapel has changed depending on current trends and styles. Especially the 1930s and 1970s are known for suits with very wide lapels. Nowadays most designers opt for medium-width to narrow lapels. To read more on lapels and to see sample pictures of each style we also invite you to read our blog entry on Lapels on a Mens Suit.